The hills and mountains of the Snowdonia National Park are one of the main attractions of North Wales, bringing in visitors from all over the UK and even further afield. Top of most walkers tick list is the peak of ‘Snowdon’ itself (Yr Wyddfa), the highest mountain in Wales, and higher than anything in England as well (See posts #86 and #39). However, popularity means busy, and Yr Wyddfa is not the place to go to for peace and solitude. For that, you need to visit the Rhinog Hills. 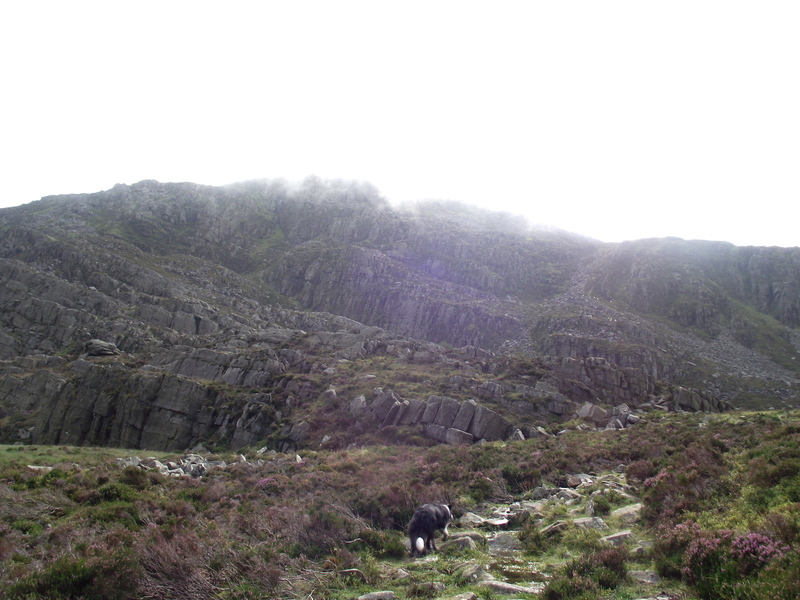 The Rhinogs are one of the forgotten ranges of Welsh hills. 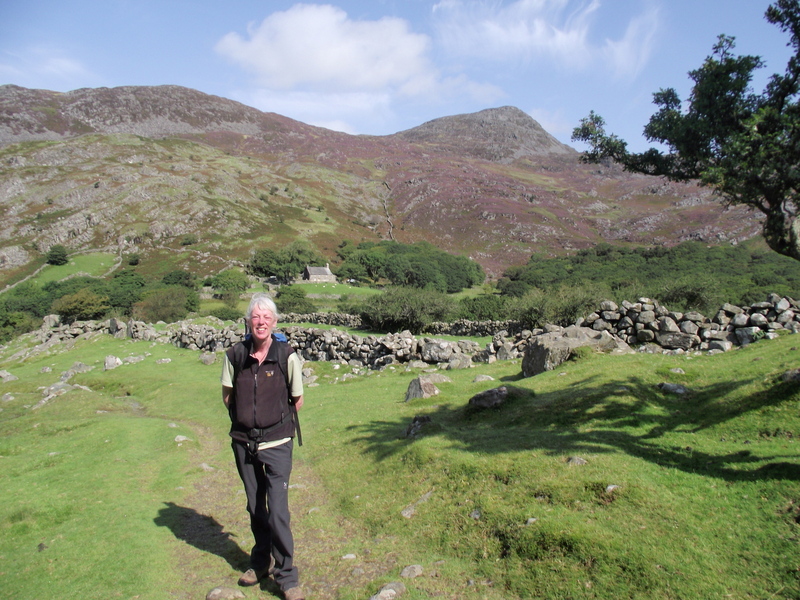 They look their best viewed from the West Coast near Harlech, but the approaches are along winding narrow lanes that are impassable to sightseers in large coaches – these hills feel more remote and isolated because they are, err … remote and isolated! This makes them a haven of peace in a busy world. The name Rhinog means ‘Threshold’, and these hills are indeed a threshold between the valleys of the Rivers Eden and Mawddach to the east and the sea to the west. 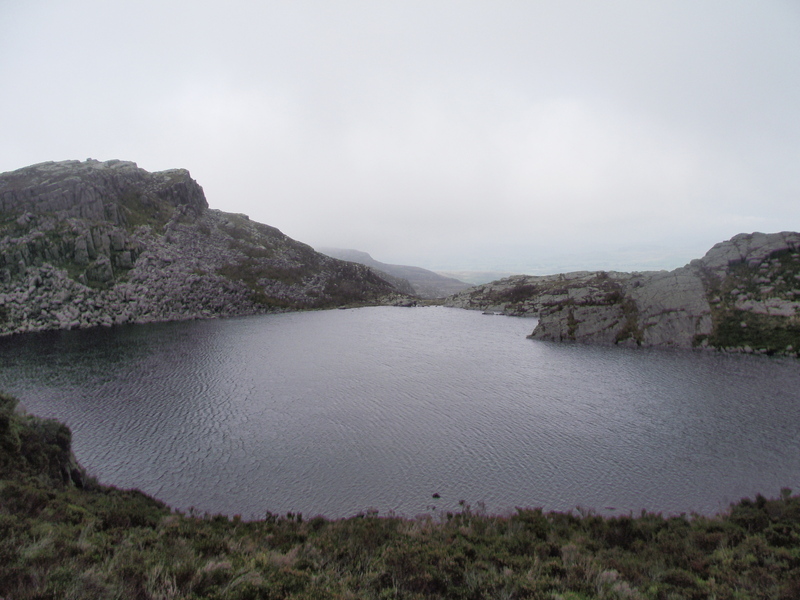 The hills giving their name to the range are Rhinog Fawr (‘Big Threshold’) at 720 metres height and Rhinog Fach (‘Little Threshold’) at 712 metres. To confuse matters, Y Llethr (‘The Slope’) is the highest peak of the range at 756 metres, but the apparent lack of altitude does not mean an easy ride – these are rugged, gnarly hills. To the north the Rhinogs (or Rhinogydd in Welsh) are rocky and covered in dense patches of heather – trying to force a direct path though this stuff would be arduous and time consuming, but on the ‘Roman Steps’ route it had all been done for us. 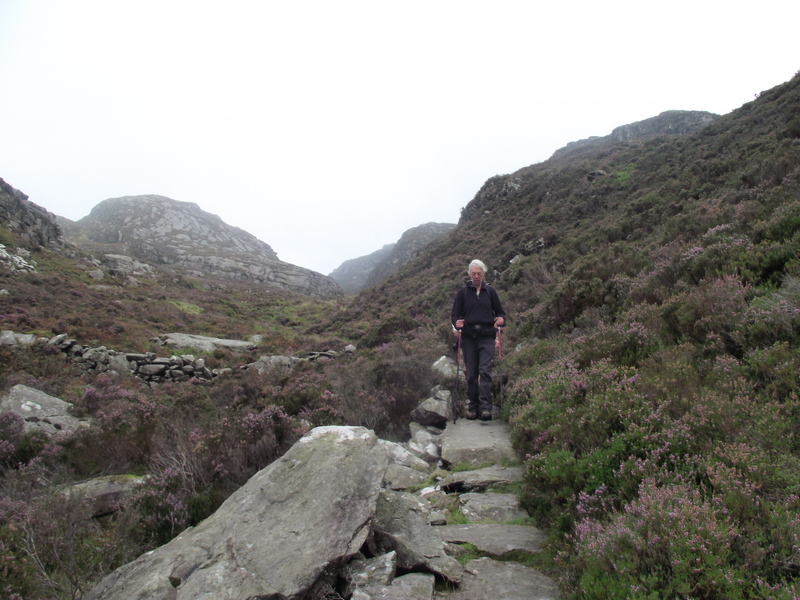 The path wasn’t in fact engineered by the Roman Legions, but it is certainly old, a medieval pack-horse route that once linked Chester to Harlech on the coast. 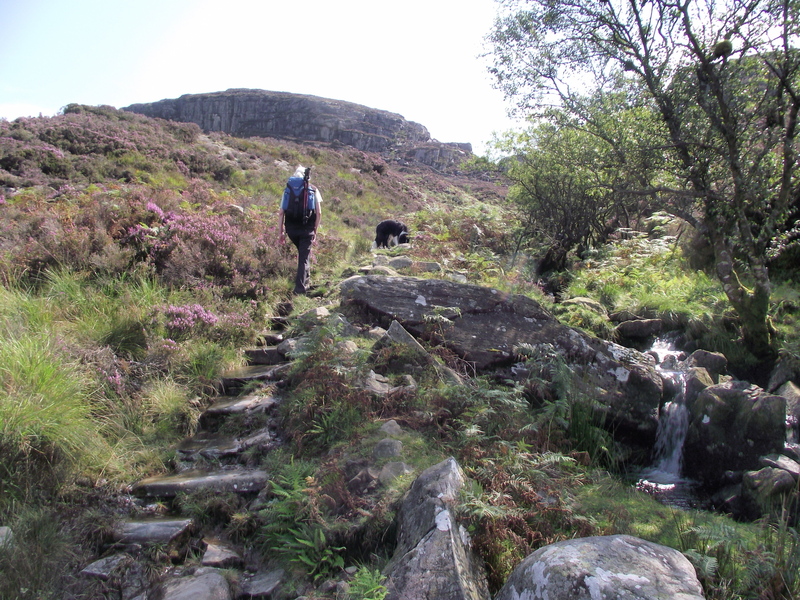 Approaching the high point on the Roman Steps path …. A pack-horse trail was good enough for the likes of us, and over 2.5 kms we gained 300 metres altitude with barely any effort. The route may be ancient, but it was built to last, and will probably still be there in a few more centuries. 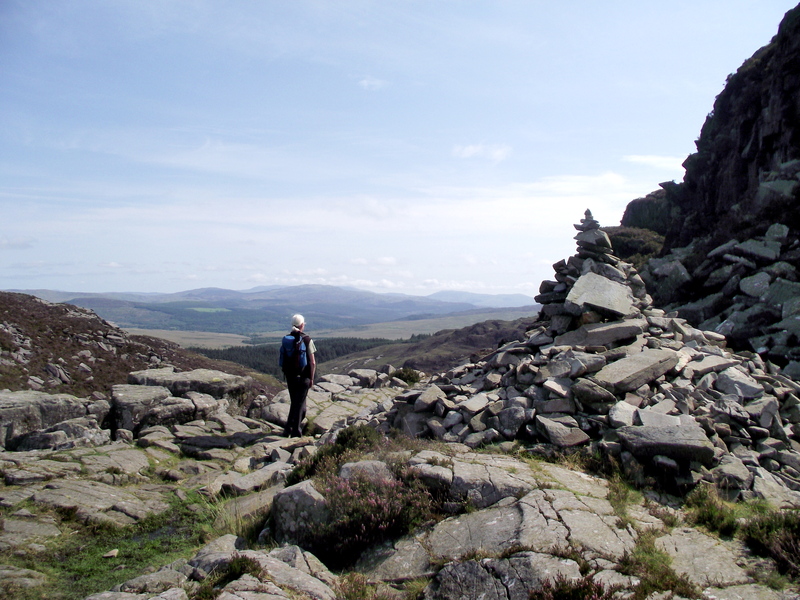 We reached the high point of the route near a large cairn, with a superb view opening up to the southeast, but from here on things were to get tougher as we left the ‘Roman Steps’ route. 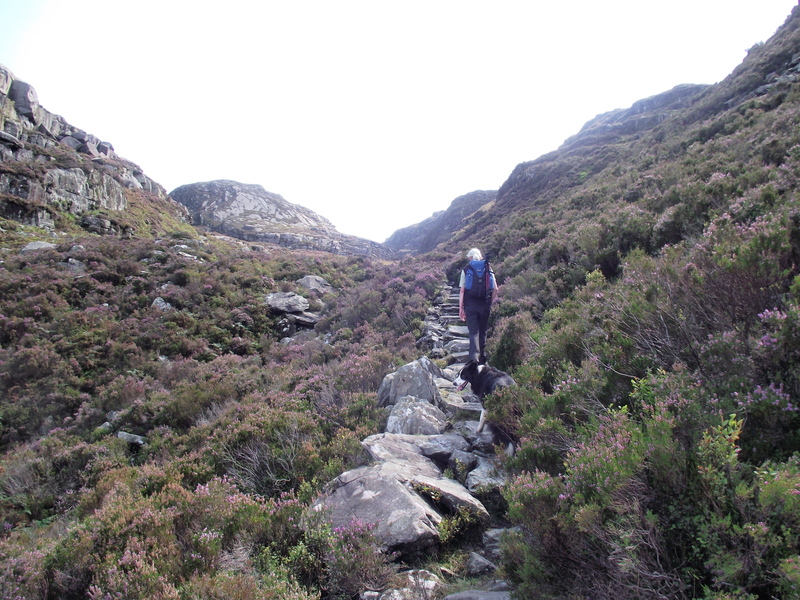 In this case, the getting tougher bit was relative – the ground we had to cross looked rough, but a narrow, well-walked path cut through the heather and boulders, taking us to the isolated and beautiful Llyn Du (‘Black Lake’). 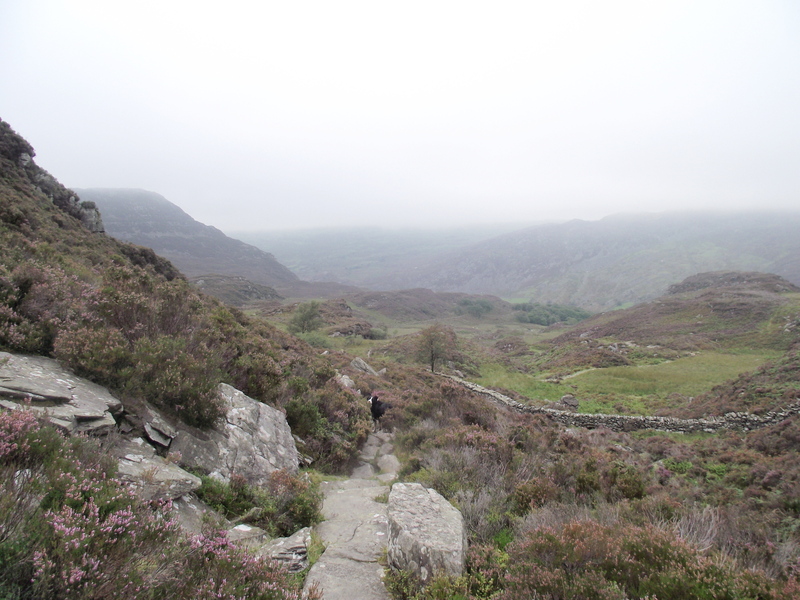 If we were pleasantly surprised by the easy progress on the path, we were somewhat dismayed to see the mist closing in on Rhinog Fawr. 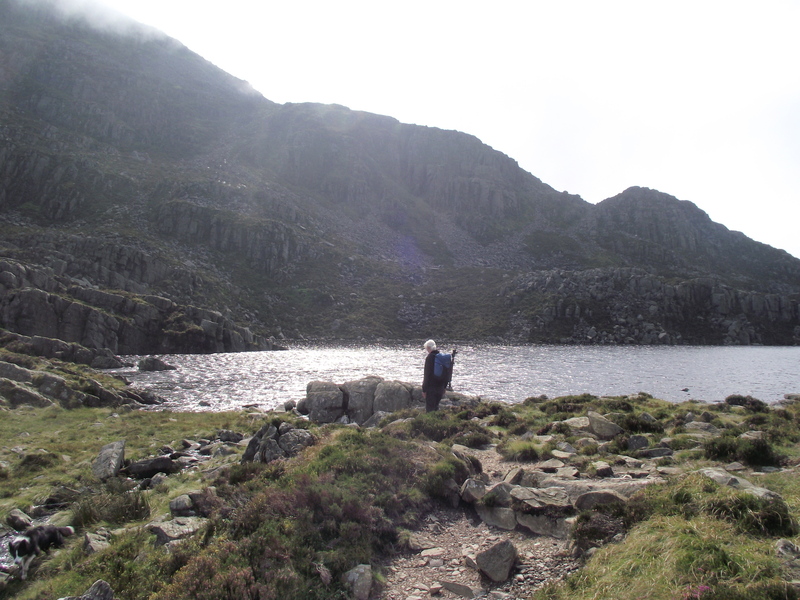 Having reached Llyn Du, Chris decided to admire the scenery from the lake, leaving me to make a super-fast dash to the summit and back. 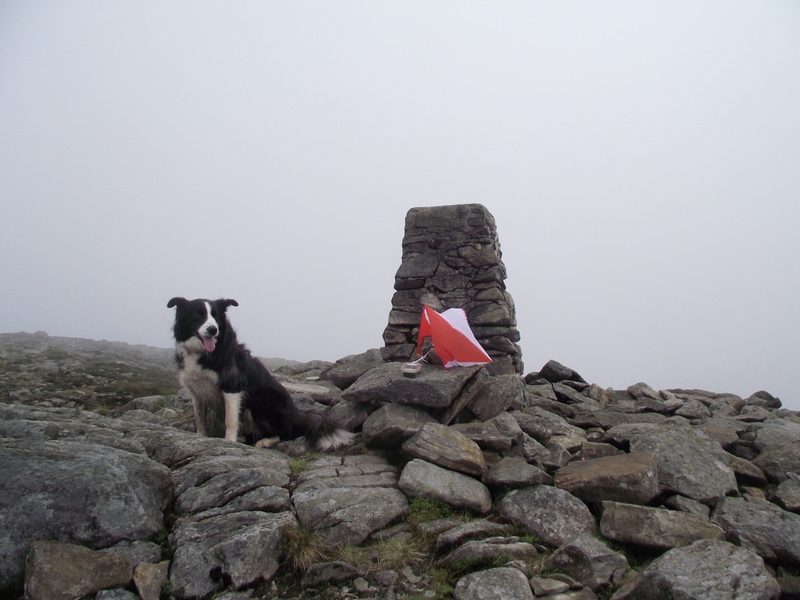 There was little doubt over our Border Collie’s intentions – ‘Mist’ was also going to the top. 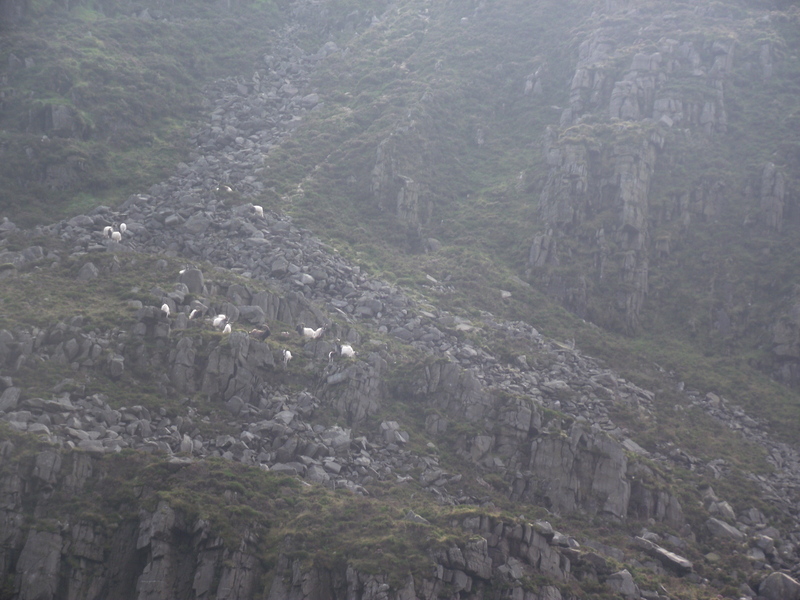 On the way we passed a herd of about twenty wild goats, indifferent to man and dog charging up and down their mountain. The summit Trig Point had an orienteering marker attached – apparently others also enjoy dashing up and down Rhinog Fawr. 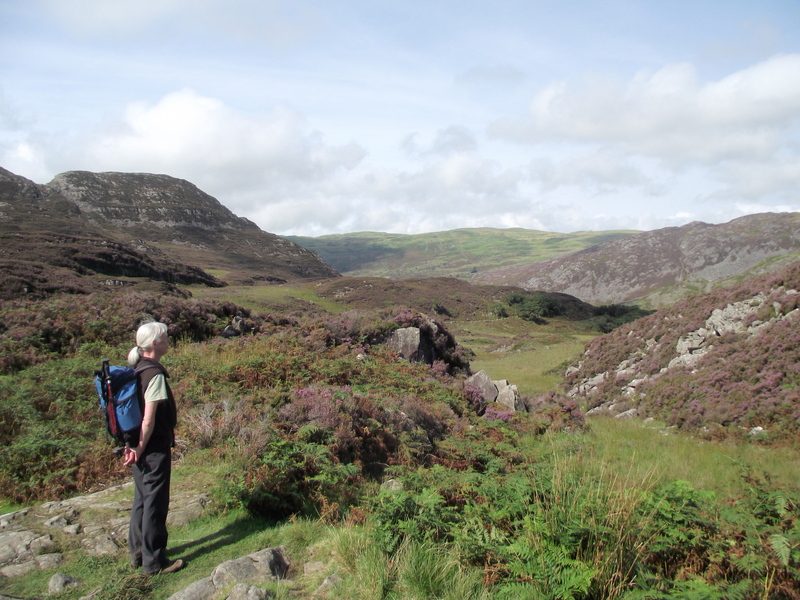 The return to Llyn Du …. ‘Mist’ and I were back with Chris in less than an hour, which was long enough for ‘T-shirt’ weather to change to ‘fleece mid-layer’. Having claimed the ‘Big Rhinog’ we bailed out to return by the same route. 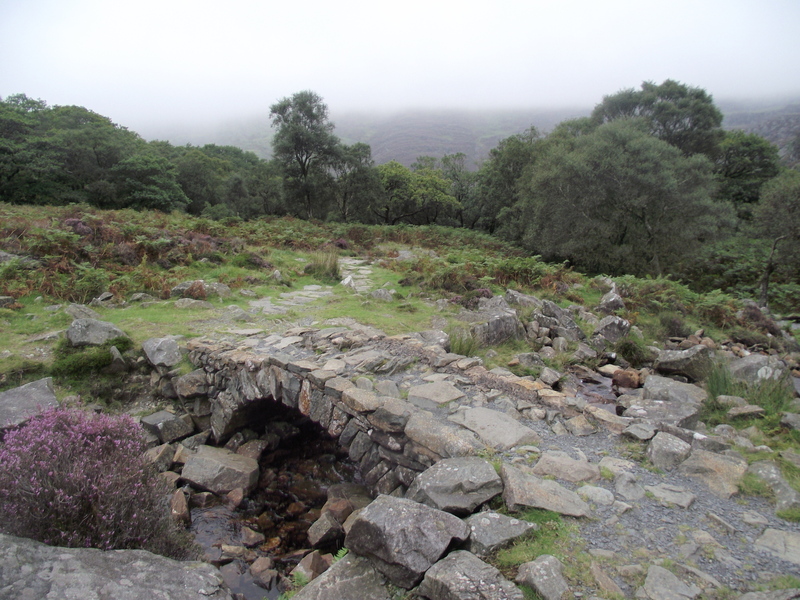 If the weather became gloomy, the mood was lightened by meeting John (aged 78) and his son-in-law Raish, who walked down the Cwm Bychan with us. 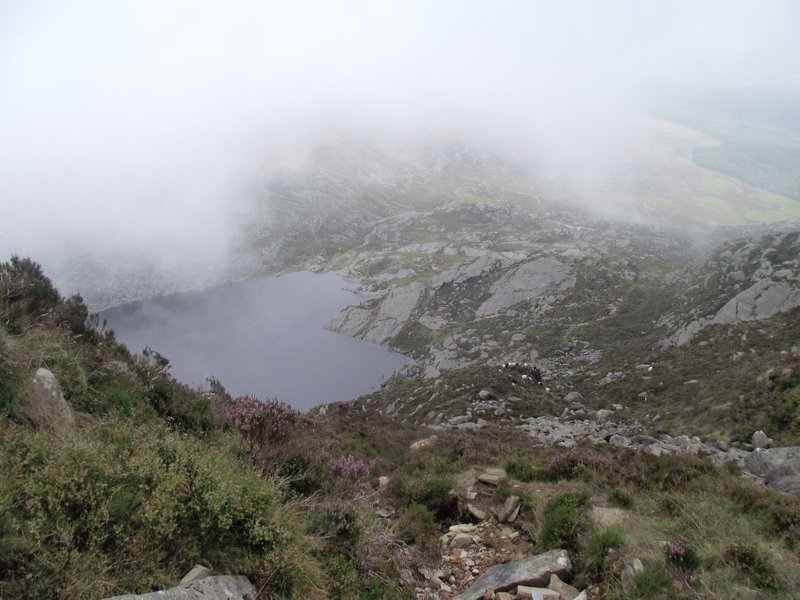 If I’m still walking the hills at 78, that will give me plenty of opportunities to re-visit this lovely area. p.s. 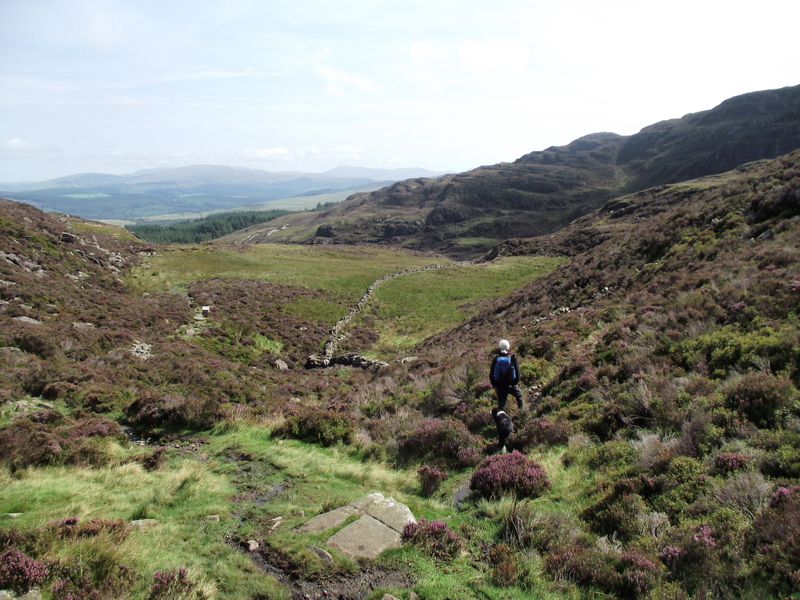 As we walked out, I had no idea that two days later I would be back in the ‘Rhinogs’, and in the sunshine for once …. Love the caption, ‘Mist in the mist’! I am ashamed to say that we are sadly lacking when it comes to exploring Wales. 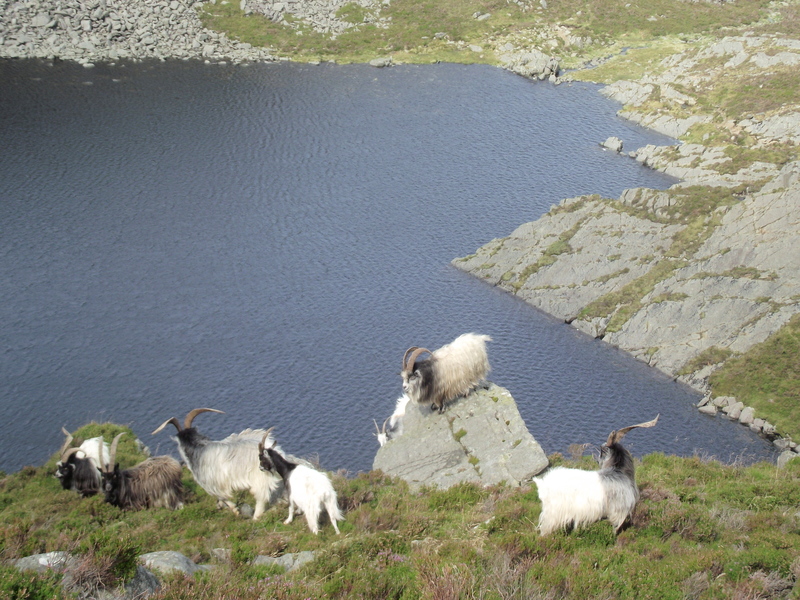 We’ve done Snowdonia and Snowdonia and Snowdonia….but never any of the other ranges. Needs rectifying I think! 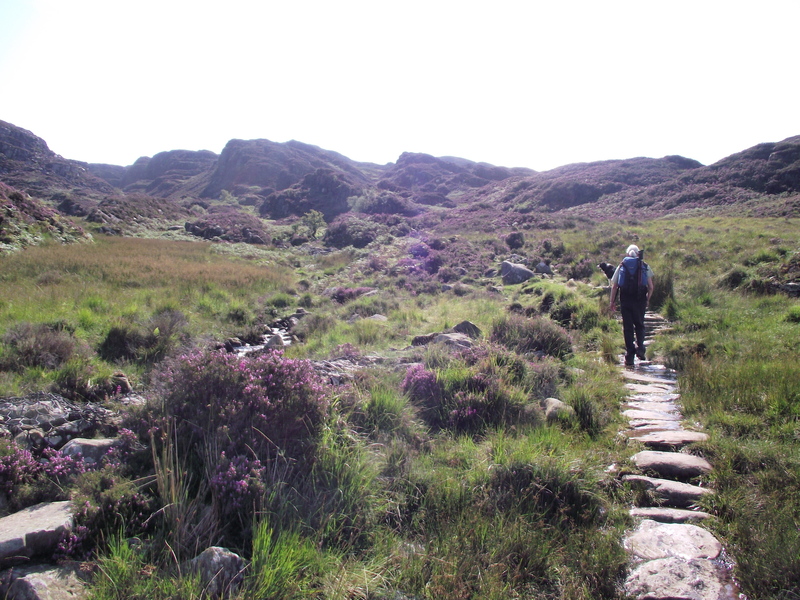 Brought back memories of walking the hills last year: http://halfwayhike.com/2011/06/20/walking-the-rhinogs/ . I really liked the little campsite we stayed at near the start of your walk and the woodland there was a nice place to sit at the end of our hike (as we did it in reverse as it were). What a great looking heathery stony jumble of a place. Your post illustrates very nicely how quickly the weather can change – what a difference in the photos at the start and finish. I must say though, ‘top of most walkers tick list’ is a bit off putting. We do our best to avoid those blood thirsty critturs!! I love the Rhinog but have only done Fawr once. I’ve often looked at it from the Roman Steps but didn’t think there was a path that way. 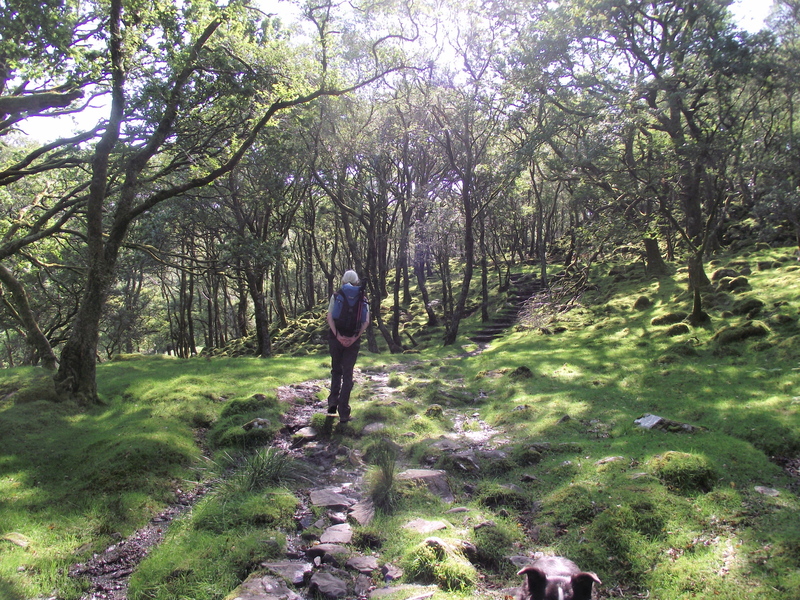 The many times I’ve done the Roman Steps (which I love), we used to contour round Rhinog Fawr to the other pass (can’t remember which is which now) and come back down into Nantcol. Not hills I’d like to be on in a mist though! I think those hills have to be the roughest walking in Britain myself! I used to be lucky where I used to stay in Llanbedr in that she used to lend me a bike to cycle up to Cwm Bychan – it was a lovely route to cycle and saved the huge parking fee. The parking’s much more reasonable in Nantcol (was an honesty box at the farm at the road-end) and the routes are probably easier too. Do you ever do them from that side? Hi Paul, I have been so busy of late not had much time to post up anything or read other blogs. I always hear good things about the Rhinogs, but I have never been. Looks like you had some good weather on your trip. The second day was better, but sometimes it’s worth just giving it a try. 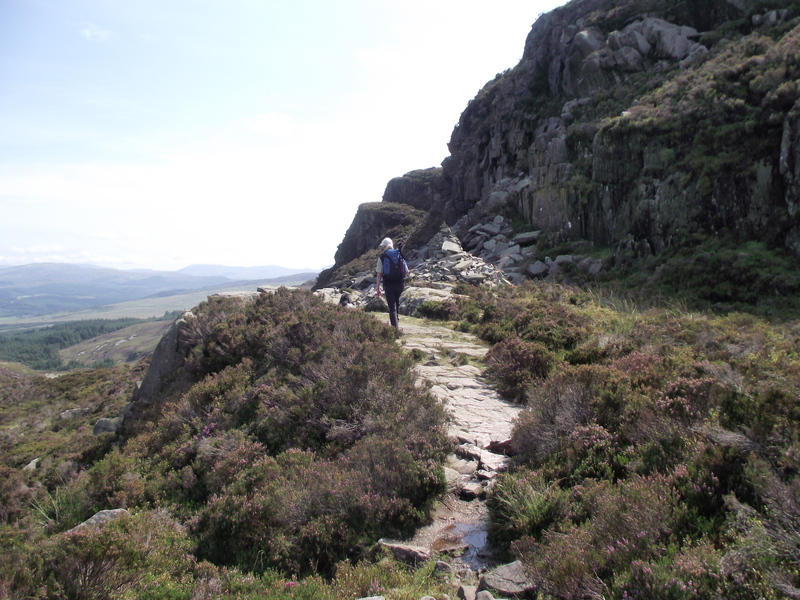 I’m a recent convert to the Rhinogs, but there’s lots of other stuff in Wales that’s also waiting. So much to do ….